The Significance of Having Curly Hair: That's my Mommy! What happened today is the hook that at pulls your heartstrings, the exact sentiment that makes parents wish that their little ones would never grow up. Until I had my own child I never knew what they were talking about because you just can't fathom love on that level. That particular type of adoration did not exist before and now it suddenly does. Oh how you want to savor it for eternity, store it away in a bottle for when you need just a little reminder of its sweetness. Yes, today was that day. 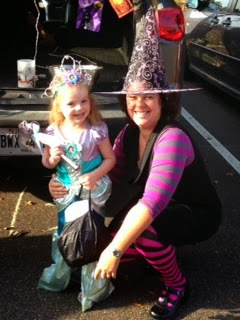 The event was the annual Trunk or Treat in Senia Mae's preschool parking lot. I had dropped her off in her costume earlier that morning and the parents were to set up their trunks by ten thirty, so the students could trick or treat while school was is session. I had talked about decorating the trunk and handing out treats, assuming that Senia Mae understood the plan but left out that I was dressing as a witch, thinking nothing of it. Ten thirty came, I decorated the back of the SUV with pumpkins and hanging ghosts,impressed by the amount of creativity and effort that all of the parents had put forth. Looking down the long row of cars I saw the three year old class come through the double glass doors. They stopped first at a car close to the entrance and began making their way to my end of the car line, on the farthest side of the parking lot. Senia Mae, in her frilly Ariel mermaid/princess costume pivoted on her set of blue high heels and spotted me off in the distance. I saw her face light up as she ran towards me shouting "That's my mommy! That's my mommy!" "Ms. Wendy, that's my mommy...it's her right there" as she waved her index finger frantically in my direction. My heart melted instantly. She squealed with delight repeating the line several more times after posing with me for a few quick photos. I felt like a celebrity. At that single moment I was what mattered most to that child, not candy, not television, but me, her mommy, the true apple of her eye, and all because I showed up and wore a costume. It was hard to believe that something so simple brought her so much joy and pleasure. I wanted to bask in the glory, allow myself to feel the pride of that moment because just then I was at the top, but like the wind rolling off the mountainside,those moments pass quickly. I now know why people never want their kids to grow up. You can not get that feeling anywhere else and I know I will crave it for the rest of my life. The sweet, purity of unfiltered hearts...it is as good as it gets.